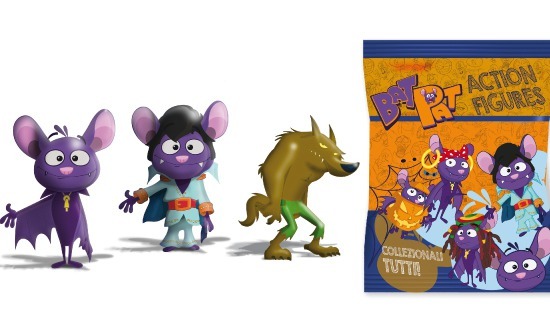 Altantyca Entertainment’s licensing division has secured a new licensing deal with Italian Specialty toy and gift company, Tema Promotion for their spooky animated adventure-comedy for kids, “Bat Pat”. Tema Promotion will produce a collection of 3D figurines based on the wonderful characters from the newly completed animated series. Starting in early spring 2017, 12 new playful 3D figurines in a diversity of styles will be sold in flow packs and (the always exciting and surprising) blind packs at kiosks (newstands) throughout all the country. The collection will include the lovable “Bat Pat”, the Silver Brothers Martin and Leo, adorable Rebecca and many of the creepy characters. Tema will support the new toys with an extensive broadcast and social media advertising campaign. “Bat Pat” is produced by Atlantyca Entertainment and Imira with the participation of Rai Fiction and RTVE and has already been sold in Italy, Spain, Belgium, Sweden, Lithuania and Middle East. Bat Pat (52 x 11 min) is the spooky animated adventure-comedy that proves the supernatural isn’t always evil – just misunderstood. Bat Pat is joined by Silver siblings: Rebecca, Leo and Martin, and a range of lovable creepy characters. Together with their winged companion, who has a terrible memory for supernatural facts with a keen nose for nocturnal mischief, the four best friends work to help the quirky “Fogville” town dwellers to unravel the mysteries of the scary creatures that lurk about. Balancing comedy and action, the series is a spooky sitcom that maintains the fast paced quirky character humor of a traditional comedy mixed up with some unexpected adventures.